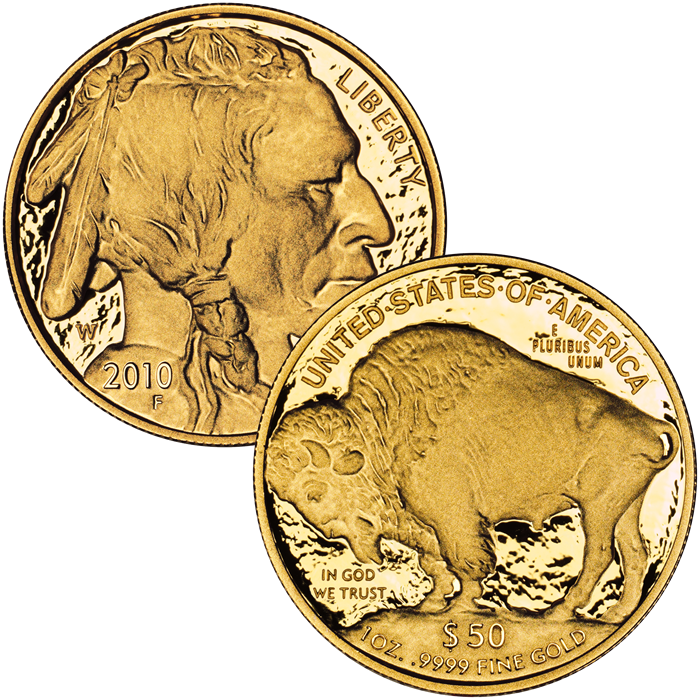 The 2010-W American Buffalo Gold Proof Coin marks the fifth year in which the US Mint has struck the pieces which each contain one ounce of .9999 fine 24-karat gold. The coins were authorized by extension of the Presidential Coin Act of 2005 which dictated a bullion version of the Buffalo coin be struck. Both varieties feature the noted design work of James Earle Fraser which was first featured on the 1913 Nickel commonly referred to as the "Indian Head" or "Buffalo" nickel. Struck to proof quality, each of these coins feature brilliant detail and a mirror-like background. In 2008, the US Mint also struck fractional Proof Buffalo Coins in 1/2 ounce, 1/4 ounce and 1/10 ounce sizes. Each Buffalo is struck to proof quality from one ounce of .9999 fine gold. June 3, 2010 was listed by the US Mint as the Buffalo Proof release date.. The US Mint bases the price of the Gold Proof Buffalo on its precious metal pricing matrix which ties the price point to the previous weeks average of the London Fix for gold. The coins of this series are all struck at the US Mint’s facility in West Point and show the "W" mintmark. 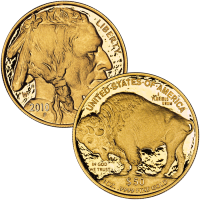 The design for the American Buffalo Gold Proof Coin is based on the 1913 Nickel by James Earle Fraser. It features the portrait of a Native American on the obverse (heads side) and the image of an American Bison (also known as a buffalo) on the reverse (tails side).